Looking for a wedding slideshow? You want to entertain your wedding guests with a wedding slideshow on your special day, let us help! Get rid off those old fashioned lame powerpoint slideshows and welcome yourself into today’s way of creating a wedding slideshow. In the old days, creating wedding reception slideshows were a lot of work to do by yourself. Nowadays, your guests are all on social media and have their smart phones in their pockets. 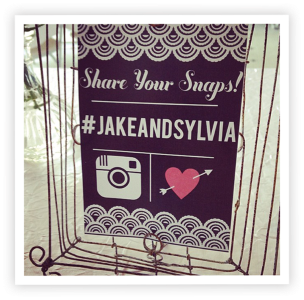 Let your guests take part in creating the slideshow for your wedding by using weddinghashtagwall.com. Your slide show should be as unique as your wedding. That’s why you are looking for unique wedding slideshow ideas, luckily you found us. 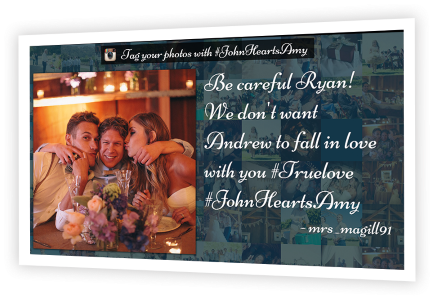 WeddingHashtagWall is a unique wedding slideshow that you have not seen before. Our beautiful visualisation technique shows all your social media images from Instagram (and twitter) with your unique hashtag, Live! A unique wedding slideshow, without you having to go through all those pictures and put in hours and hours of work. Even better, you get a download of all photos made by your guests! How does our wedding slideshow maker work? Our wedding slideshow maker is easy to use and setup within minutes. 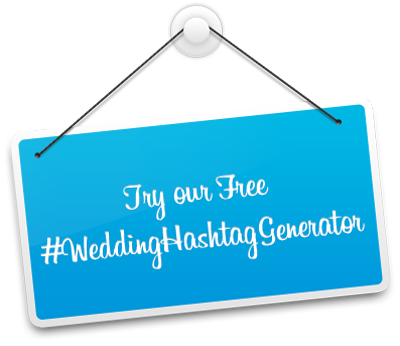 You choose your hashtag, images that are posted to Instagram (and twitter) with your hashtag will instantly show up in your WeddingHashtagWall. The easiest and best wedding slideshow software you can find out there. Just have a look at our video and find out how easy our slideshow maker works. Try our wedding slideshow maker for free and see how easy it is how to make your wedding slideshow. Try your free wedding slideshow maker now! Wedding Hashtag Wall is a product of TweetBeam B.V. Our small team based in Amsterdam is passionate about social media, technology and data visualisation.